Morrissey has announced a series of New York City concerts for 2019. In April, the Smiths frontman will head out on a tour through Canada for the first time in almost twenty years. The newly added NYC performances are scheduled from May 2 to 11 at the Lunt-Fontanne Theater in New York City's Midtown Theater District. 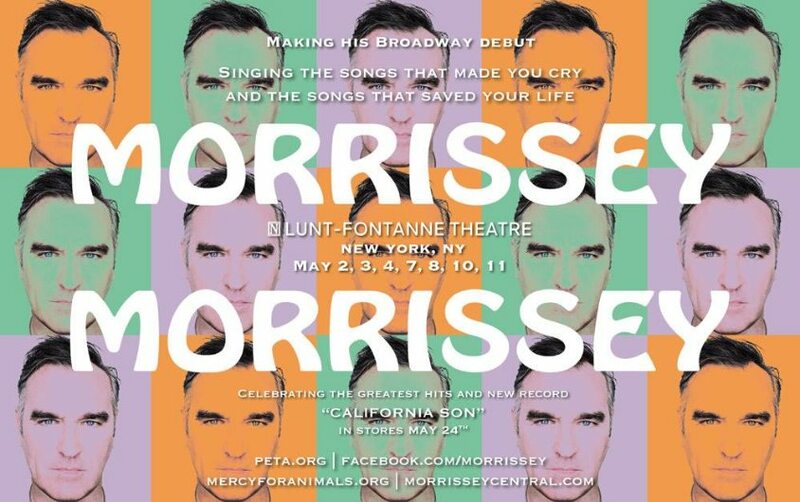 Fans can expect to hear Morrissey's past hits along with selections from his upcoming album, California Son, due out on May 24. When do Morrissey 2019 NYC tour tickets go on sale and what is the presale code? Tickets for his previously announced shows are now on sale. For the new dates, the general public on-sale begins as early as March 8 at 10 am ET. Presales for fans who preorder the upcoming album begins on March 6. Live Nation and LN Mobile App presales will follow. The Live Nation / Ticketmaster presale password is MASHUP and the LN Mobile App code is COVERT. Keep in mind, each date is different and details are subject to change. Click through the individual concert links for more information about the show you're interested in. We recommend following Morrissey on social media and signing up for his free email newsletter (bottom of page), in addition to checking your local venue’s social media and email subscription service, to get the most up-to-date information. For more, check out Morrissey's Zumic artist page.